This recipe is my staple vegetable lasagna concoction. 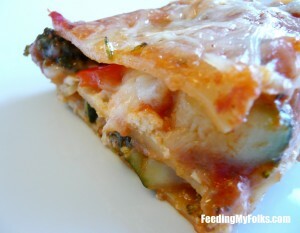 I think it was the first veg lasagna I ever came up with, and I kind of just stuck with it because it’s so good! Lasagnas are perfect to make in advance, and then just stick in the oven when you need it. I love how it’s packed full of vegetables. No one ever misses meat when eating this hearty, delicious, and filling meal. Preparing it is a bit time consuming, but I really do suggest taking extra time to place each layer neatly. When you take the time, each piece will look great….we eat with our eyes, so why not make it pretty! In a large skillet, sauté the garlic, onion, and red pepper flakes in the oil/butter over medium heat (around 5 minutes). Add in the sliced mushrooms and cook for 3-5 minutes, or until they cook down a bit. Add in the broccoli florets. Stir to combine. Add a pinch of salt. Cook for 5-6 minutes. Add in the zucchini and diced bell pepper. Stir to combine. Cook for 5 minutes. Add in the oregano and tomato sauce. Stir to combine. Cook for around 10 minutes, or until the sauce has reduced a bit and vegetables are tender. Remove from heat. In a bowl, stir together the ricotta, parmesan, and egg. 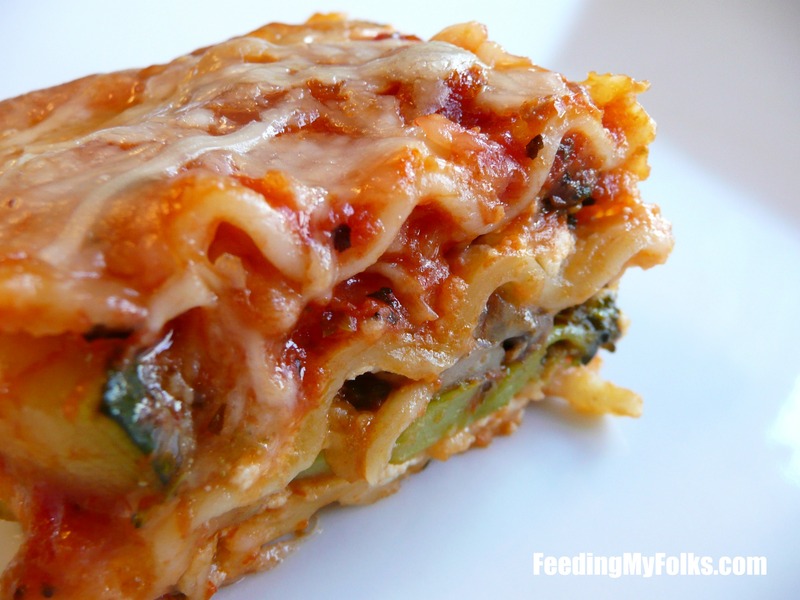 Cook the lasagna noodles as indicated on the package (usually 8-10 minutes in boiling salted water). 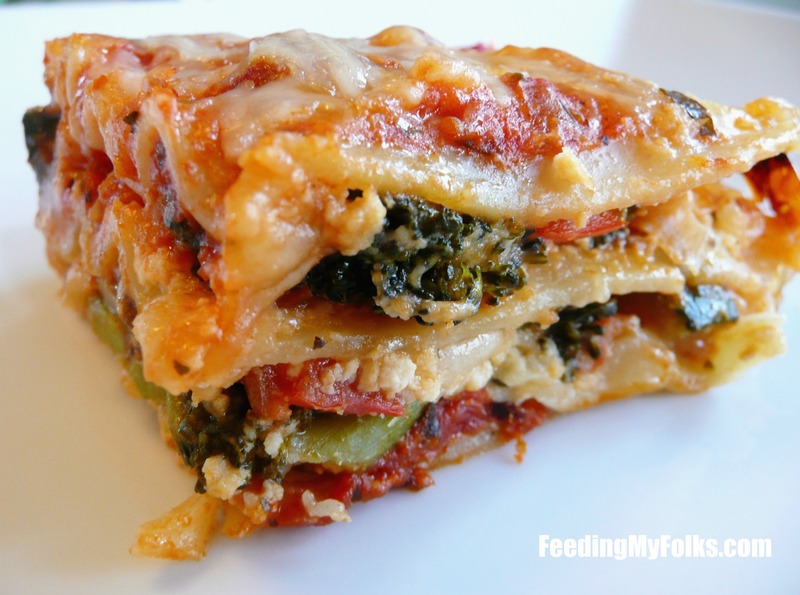 In a 9×13 casserole pan, pour ¼ cup of sauce. Spread to coat the bottom of the pan. 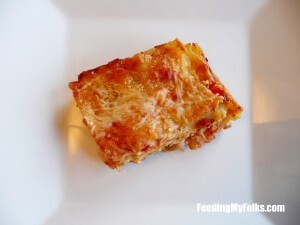 Lay out 4 of the lasagna noodles (I always have to cut one so it fits). Spread half of the ricotta mixture onto these noodles (it will be a relatively thin layer). Spoon half of the veggie mixture over the ricotta. Sprinkle with a little less than 1 ½ cups of the mozzarella cheese. Lay 4 more noodles on top of the mozzarella cheese. Repeat all of the steps – ricotta, vegetables, mozzarella, noodles. Pour ¼ cup of tomato sauce over the top layer of noodles. Then sprinkle with any remaining mozzarella cheese and then ½ cup shredded parmesan. Cover with tin foil and put into the oven. Bake for 20 minutes, remove the tin foil cover, and then bake for 20 minutes uncovered. 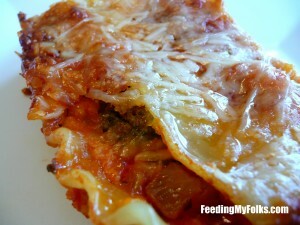 I haven’t frozen it before, but most lasagnas freeze pretty well. Hope that helps! Made this for dinner last night and it was delicious! The whole family enjoyed it. I also added a bit of frozen spinach to it! Awesome! Glad you liked it, Christy :). 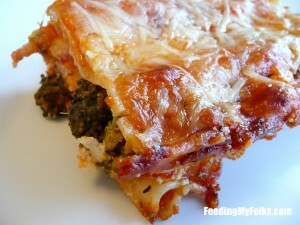 I LOVE spinach, so great addition! Super tasty! Thanks for sharing. I can’t wait to try this! It really looks excellent! It’s really good! Let me know what you think when you make it. 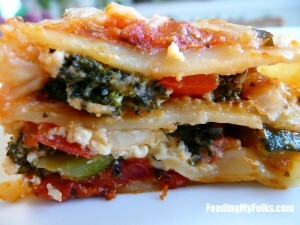 We like our lasagna wiuthot any kind of ricotta. Just vegetables (eggplant and/or spinach) and sometimes seitan crumbled in tomato sauce. We also never precook the noodles. Just throw the whole wheat noodles straight in the pan making sure they’re completely covered in sauce and cover with foil while it cooks so they sort of steam.I think you’re Italian-American, and I’ve probably just completely horrified you.